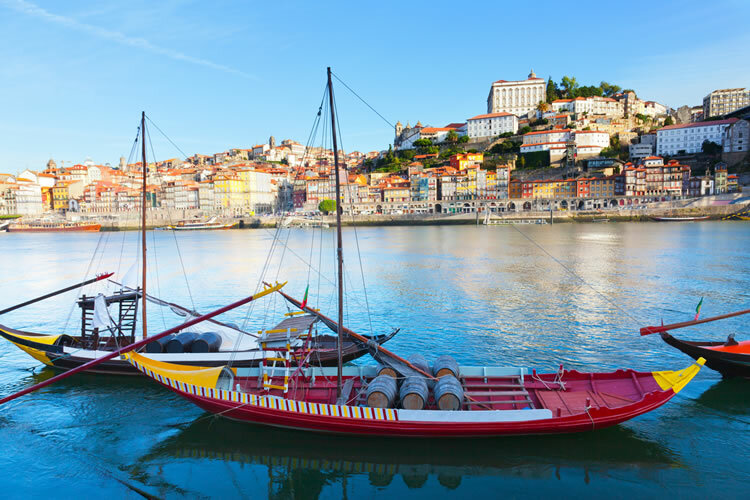 Enjoy the Portuguese culinary delights and regional wines while you take a seven night luxury river cruise from Porto to Barca d'Alva along the historical Douro River and enjoy a one night stay in Madrid. Fly from the UK to Porto. On arrival, be met and transferred to your river ship for a Captain’s Welcome Reception. FREEDOM OF CHOICE: Today you will be able to explore Porto your way with a choice of sightseeing. Explore Porto’s Old Town and delight in its 16th-century buildings. Take a cable car ride and enjoy a port tasting. Alternatively, journey to Matosinhos and visit a traditional restaurant for a cooking demonstration of local delicacies, or enjoy an active walking tour through the medieval streets of Porto and the old harbour quarter of Ribeira. Back on board, enjoy dinner this evening. Take a morning excursion to Guimarães, an authentic and well-preserved showcase of the evolution of medieval settlement. Back on board, enjoy some scenic cruising through the Douro Valley en route to Entre-os-Rios. SIGNATURE EXPERIENCE: Visit Quinta da Avelada, a family business that has been producing wine in the Douro region since the 1870s. Here, explore the gardens on a tour, followed by a wine and cheese tasting and private dinner. This morning, delight in the beauty of this sun-drenched region as you cruise to Régua. On arrival, visit the Douro Museum, which provides an incredible insight into culture of the Douro Valley wine region. FREEDOM OF CHOICE: Tour the ancient town of Lamego and visit the Sanctuary of Our Lady of Remedies. You’ll then sample bola de Lamego, a delicious specialty dish of the region. Alternatively, enjoy a visit to Quinta da Pacheca for a picnic with breathtaking views over the Douro River and Régua. Afterwards, continue cruising through the dramatic gorges of the Douro Valley to Pinhão, where you’ll enjoy dinner later this evening. Take a trip to Palacio de Mateus, located near the city of Vila Real. Built in 1745, the palace offers a wonderful insight into the lives of Portuguese aristocracy. SIGNATURE EXPERIENCE: Afterwards, visit Quinta da Avessada for a traditional lunch, followed by a port wine tasting at Quinta do Seixo. Enjoy the Captain’s Farewell Dinner on board. Travel to the tiny fortified village of Figueira de Castelo Rodrigo today. On a tour here, see the castle ruins, and take in spectacular panoramic views of the Douro Valley and surrounding towns. Back on board, enjoy a delicious dinner this evening as you make the most of your last night. Disembark in Barca d’Alva today and travel to the ancient city of Salamanca. During a tour, see the University of Salamanca and the House of Shells. Afterwards, continue to your hotel in Madrid, where you will be able to enjoy the evening at your leisure. This morning, transfer to the airport for your return flight to the UK.